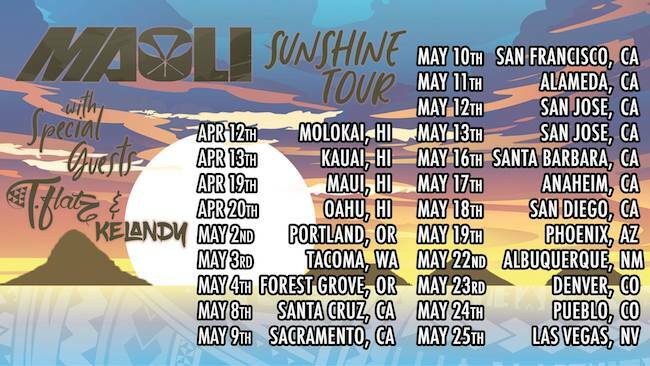 On the heels of releasing their latest single "Sunshine", Maoli is set to head out on tour starting April 12th perfectly titled the "Sunshine Tour". Heading out on the trek with the band will be Tflatz & Kelandy. The start of the tour kicks off in Hawaii for the first 4 dates and then hitting up much of the West Coast. If you haven't had a chance to hear the new song "Sunshine" catch it below along with a full list of their tour dates. As always be sure to support the band and purchase the new single by clicking here.